These might be my new favorite snack! At first glance you might be turned off but I urge you not to judge this yummy snack on first impressions. They have a delicious cinnamon taste that kind of reminds me of applesauce. What I really love about them is they are CRUNCHY. I don’t know about you, but I get pretty hungry around the 3 or 4 o’clock and crave a crunchy snack. The bag is even resealable to keep them crunchy. Which is important because there is nothing worse than when your crunchy snack goes soggy and stale. A crunchy tasty snack that is good for you is hard to find. There are always the typical crunchy snacks like chips and pretzels but they are kind of tired and don’t really do anything for my figure. Apple chips are different option. Of course if you don’t like apples they are probably not the snack for you. This was the case with my daughter who I made try them, needless to say she is not a fan. I carried them around with me for a few days and asked people to try them out, and the results were overwhelmingly positive. People at first were cautious but eventually tried them and liked them. I didn’t not get too many positive votes from kids but adults really thought they were a great snack. 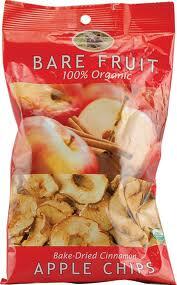 Bare Fruits Cinnamon Apple Crisps are 100% organic, fat free, gluten free with no added sugar or preservatives. They are such an honest simple snack. And for those of us who are always counting Weight Watcher’s points one serving is only one point. A pretty great snack and very satisfying, especially for only one point! To purchase Bare Fruits and try out this distinctive snack for yourself check out their website Bare Fruits. This entry was posted in Family, Food & Snacks and tagged 100% organic, Apple, apple chips, apple crisps, applesauce, Bare Fruits, Cinnamon, Cinnamon Apple Chips, crunchy snack, crunchy snacks, fat free, food, gluten free, Healthy Snack, Snack, Weight Watchers Points Plus, yummy snack. Bookmark the permalink.